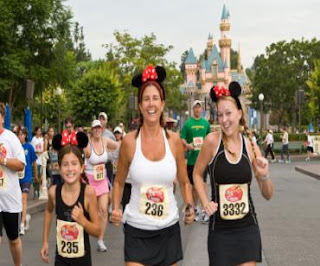 Are you Running the Disneyland Half Marathon this Labor Day? Calling all Disneyland fans, exercise enthusiasts, and Labor Day celebrators! Rent an Anaheim timeshare and head to Disneyland this Labor Day weekend for the 5th running of the Disneyland Half Marathon! The Disneyland Half Marathon Weekend starts Friday, September 3rd and goes through Sunday, September 5th, with the actual Half Marathon being run on Sunday. Part of the weekend activities includes the Disneyland Health and Fitness expo, open to the general public and located in the Disneyland Hotel Exhibit Hall. You'll be able to see the latest in running and fitness equipment as well as have the opportunity to hear expert speakers offer running tips, instructions - and inspiration. You can participate as a runner (walking is just fine, too!) in the half marathon, help as a volunteer, or enjoy it as a spectator. A record field of more than 14,000 participants have already registered for the 13.1 mile run. There are a number of different divisions including the Master Division (age 40+) and the Wheelchair Division. The course travels through both Disneyland and California Adventure, and along Anaheim streets with landmarks such as the Honda Center and the Angel Stadium of Anaheim. Cheering Disney characters and festive entertainers will do their best to inspire and encourage the participants to the finish line. Because the 5th Anniversary is a special milestone, a commemorative special edition medal featuring Sleeping Beauty Castle circled by the number "5" and running Mickey Mouse will be presented to everyone who completes the half marathon. Close to 570 “Legacy Runners” – those who have competed in the race all five years – will also receive special recognition throughout the race weekend. Nearly 2,350 runners are going for the Coast to Coast medal, which requires a runner to complete one of three qualifying races at Walt Disney World in Florida and the Disneyland Half Marathon in the same year. Some of the best viewing areas along the route include the Start at Disneyland Drive to Katella Avenue, the Esplanade between Disneyland and California Adventure, the Disneyland Hotel, Disney's Paradise Pier Hotel, and the ESPN Zone in Downtown Disney. Tickets can be purchased for reserved seating at the finish line. A timeshare rental will put you in the middle of one of the most fun and exciting Labor Day Weekend events in the country. Whether you'll be an athlete runner or a rooting watcher, just remember what Walt Disney famously said, "If you can dream it, you can do it."